Please contact me for permission to use any part of this mod. Teleport Sound- If anyone knowns the author, let me know. It was found online. The entrance is located West of Spring Mt. Ranch State Park next to a boulder and pond. Check your map for the exact location. WHEN UPGRADING- READ ALL OF THIS FIRST!! When upgrading to a new version, your load order will change. You must fix the load order so optional plugins for this mod works correctly. You do not have to do anything to your game when upgrading unless I specifically state so below. So no need to remove items from the hideout or containers unless I state to. Just copy the new versions files and overwrite the old version, that easy. If you are having crashing problems, Open up Heidi's command console and navigate to Hideout Settings -> General Settings-> and enable Purge Cell Buffer setting. That will help with any issues while in the hideout due to low memory. You need v1.3 of fallout to use v3.7 or newer of this mod. 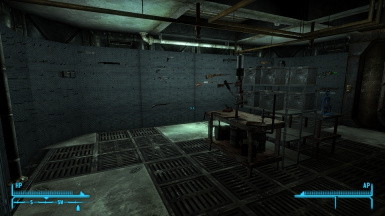 Otherwise, you wont see an entrance to the hideout. 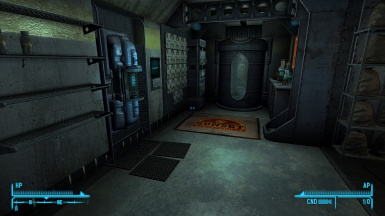 Empty any items from the nuka fridge and nuka machine in the kitchen before updating. If you see graphical errors when looking through windows in the main part of the hideout, close and re-open the shutters. 2.5 or newer, exit the hideout before updating or you will be locked in. You need v1.3 of fallout to use v3.7 or newer of this mod. 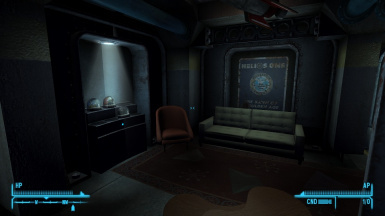 If you are using an older version of fallout new vegas, you will not be able to enter the hideout. I did not intend for this to happen. It is simply a bug/side-effect of using the new GECK v1.3. If I could change this I would. 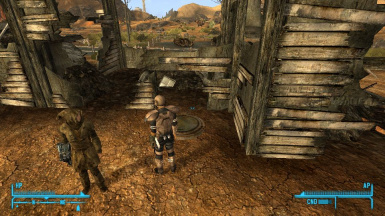 But unless I can legally find an older version of fallout new vegas (buy a DVD copy maybe), I cant fix this. Uncheck and Delete the Plug in File named "UHNV.esp" from the Data folder. Delete the BSA file name "UHNV.bsa". If you want companions to make the Underground Hideout their new home, I suggest downloading Follower Home Marker. 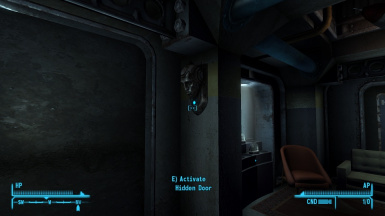 This mod will allow you to change the default location that companions will call home. To see what I see, use some high res texture packs. Install Detailed Normals first. 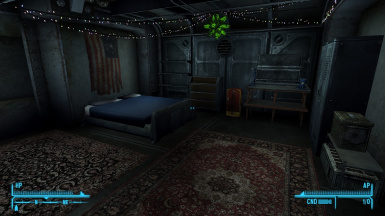 Next install NMCs Texture Pack for FO3 using Fallout New Vegas HD Texture installer to install it. If it asks you to overwrite, select yes to all. That should do it, enjoy how fallout should look. Suggested for higher end system only. Boone Beret and Hat Stand (cant be taken)/ "One for My Baby"
Repcon Rocket In Living Room / "Come Fly With Me"
Helios One Sign In Living Room / "That Lucky Old Sun"
Guitar in Living Room / "Talent Pool"
Sunset Sasparillo Sign In living room / "The Legand of the Star"
Plane Prop on Pillar / "Volare!" Vault Door on Pillar / "Why Cant We Be Friends?" Gulf Cart on Pillar / "Flags of Our Foul-Ups"
Creature Figurines On Pillar / "Bleed Me Dry"
Stealth Boy of Pillar/ "Guess Who I Saw Today"
Slave Collar On Pillar / "Left My heart"
Jail Door on Pillar / "I Fought The Law"
Crucifix on Pillar / "Cold, Cold Heart"
The Plants Kill sign in grow area / "There Stands the Grass"
Scripts edited for DLC compat. -Changes to work with future DLC patches. 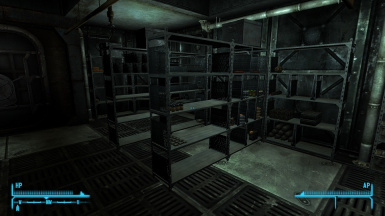 -"Utility room" changed to "Systems room"
-Start of Ordering system, weapons armor ammo coming soon!! -Fix #2 for LockDown Issues. Will have to walk through hidden door for the autolockdown to be turned on. -Key added. Located in Wooden Crate next to Entrance Door. -Movable Entrance added. Use hammer found in player bedroom to move the entrance. This file can not be uploaded to another domain or location without my consent. 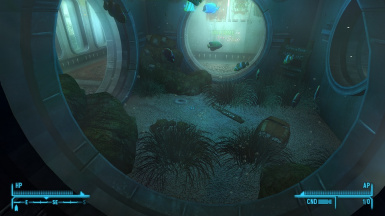 I vertify all content included in the UHNV.BSA is either original or modified from Fallout New Vegas content. For this reason, I claim no right of ownership to these files. Please contact me if you wish to use the content in any way. Send a thank you to Sagyxil for making the ammo container textures.